present :- David, Alex and Kaffe. 1. 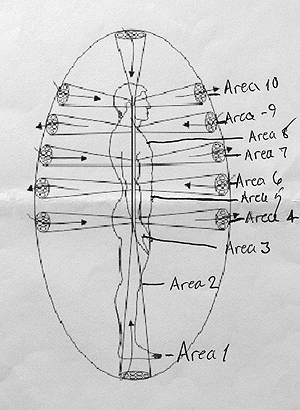 To focus on documenting the effect of particular frequencies on these areas, with the receiver communicating when they could and could no longer feel the physicality of a frequency as its amount was changed. Also for the person to communicate the sensations they were receiving, remembering to concentrate on the physical vibration of the sensation through the body and not its audible sound thorugh the ears. We then played a single frequency from 0Hz to 120Hz played through one sub woofer and the mattress to eacn node sequentially whilst documenting the frequency and our responses with text, sound and image. Approx 114Hz was found to be the highest frequency after which physical sensation could no longer be felt. The lowest frequency for sensation was found to be 8Hz. The soles of the feet were found to be the most sensitive to vibration. To be so rigorously methodical was unusual, surprisingly time consuming but worth it to collect this data. We would need another session to complete testing the 3 of us, with Kaffe intending to pull in other bodies to test in the interim. To consider the making of footstools as a new interface as the foot was found to be such a sensitive receiver of frequency variations. 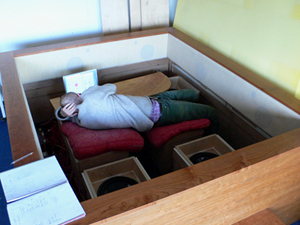 To considering using Kaffe’s chaise as an interface for specifically located frequency effects. The bed is an open space on which bodies can roll around untamed. The chair, however, holds the seated body in a specific position, so specific energy centre locations could be much more targeted.